"A comprehensive and invaluable guide to IFRS which users will find indispensable in correctly applying the complex and onerous requirements of IFRS and IAS." International Financial Reporting Standards have been mandatory in the EU since 2005 and are rapidly being adopted by countries throughout the world. In this environment it is increasingly important for managers, executives and CEOs to understand the background of the IFRS and their main requirements. 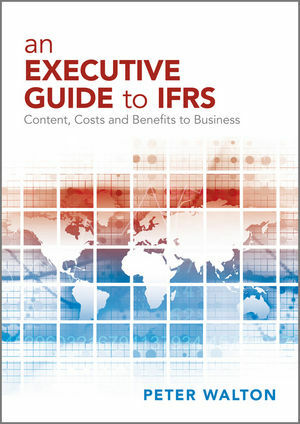 In An Executive Guide to IFRS: Content, Costs and Benefits to Business, Peter Walton provides a concise and accessible guide to the principal features of IFRS, explains why they are useful, looks at their impact on businesses, and provides some of the context to help define their global role. Part three covers the creation of the IFRS, provides details of the IASB's standard-setting process, and describes how people outside the IASB can participate in the process and lobby effectively. It also examines the history of the IASB, and includes a chapter based on the author's observation of the standard setters in action. An Executive Guide to IFRS is an invaluable resource for anyone seeking to understand the essentials of International Financial Reporting Standards. Peter Walton, PhD, FCCA, is a preparer turned academic and writer. He is now a professor at ESSEC Business School, Paris, and IFRS Director of the ESSEC-KPMG Financial Reporting Centre there. He is the publisher of IFRS Monitor which provides a detailed monthly report of IASB proceedings. He has attended virtually all the meetings of the IASB since it was formed in 2001.